Skinner decided to revert to the original proposal for two main reasons. First, he could not separate toddler, Pre-K and kindergarten classes as called for in the second proposal because of federal guidelines. Second, the school-based clinic operated by Natchitoches Outpatient Clinic could not move to another location. Skinner gave more details during a finance committee meeting Tuesday. •Toddler, Pre-K, K, first and second grades will be at L.P. Vaughn. •Third and fourth grades will be at Weaver. •Fifth and sixth grades will be at East Natchitoches. •Seventh and eighth grades will be at Natchitoches Jr. High. Natchitoches Magnet School will remain at Parks Elementary. Also of concern for some was having 800 students at L.P. Vaughn. Skinner also gave more details about Vaughn campus where there are two buildings. 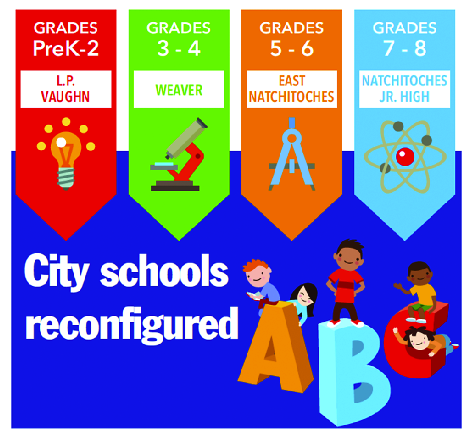 Toddler, Pre-K and kindergarten grades will be separate from first and second grades. They will be operated as separate schools with each having its own instruction staff, principal and assistant principal, office space and staff, intercom system, car release and pickup sites. The only thing they will share is the cafeteria. Skinner said at no time did he believe the original plan was not the best. “In our opinion, this is the best thing we’ve done to help students in low performing schools.” The first improvement to the school will be the installation of new flooring that should begin the day school is out. The school board will have people to move the teachers’ supplies and equipment directly into their rooms. He is working with Durham Transportation Director Jason Edwards to develop bus routes.